Charles Hodge viewed Calvin's doctrine of the union of believers with Christ's humanity in the Lord's Supper as an uncongenial foreign element in Calvin's thought, having no root in the system. Robert L. Dabney found Calvin's doctrine to be a strange opinion, which he had to reject because it is not only incomprehensible, but impossible. Were these eminent theologians correct, or did they miss the genius of Calvin's thinking at this point? Back in print at last, Ronald Wallace's classic study is a careful examination of Calvin's Commentaries, Institutes, Sermons, and Tracts, designed to clarify the teaching of the great Reformer. The following two sentences from the preface aptly sum up the author's intention: ÒWhat is most important in the study of Calvin today is to reveal what the Reformer himself actually said, in order that misconceptions about his teaching may be cleared away. Therefore this work is not a critical study of Calvin, but an attempt to express his teaching as copiously, fairly, and sympathetically as possible. Dr. Wallace's book is also valuable for the insight it gives into Calvin's method of interpreting Scripture, especially the Old Testament. 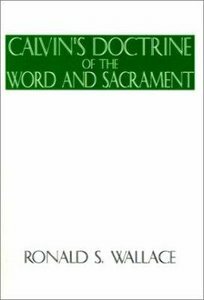 About "Calvin's Doctrine of the Word and Sacrament"
Wallace is the Felix Professor of Poetry at the University of Wisconsin-Madison and serves as general editor for the University of Wisconsin Press's poetry series. He divides his time between Madison and a forty-acre farm in Bear Valley, Wisconsin.